Sony Mobile announced the Sony Xperia Z1 at IFA 2013. Sony Xperia Z1 has 2.2 GHz Quad-Core Qualcomm Snapdragon 800 processor, 5-inch 1080p HD display, 20.7 MP camera with 1/2.3 type Exmore RS for mobile CMOS image sensor. The Xperia Z1 camera features 20.7 MP rear camera with G Lens 27mm wide angle and bright F2.0 aperture, custom made large 1/2.3-type CMOS image sensor Exmor RS for mobile and a BIONZ for mobile image processing engine. With all these features, Xperia Z1 delivers less noisy pictures, fast auto-focus and preventing shots from being blurred and the image sensor help to capture crisp images in low-light conditions. Social live: Broadcast precious moments live from Xperia Z1 to Facebook and get your friends’ comments right on your screen. Info-eye: Innovative visual search function that provides related information on landmarks and on items such as books or wine simply by capturing them with the camera. Timeshift burst: Capture the perfect shot every time – Xperia Z1 takes 61 images in 2 seconds – a second before and after pressing the shutter – so you can scroll back and forth to find the perfect image. AR effect: Overlay a selection of fun, customizable animations to create pictures using Sony’s SmartARTM augmented reality technology. Like other Xperia phones, the Z1 is waterproof and dust resistant Smartphone (IP55 & IP58). The complete body is made up with an aluminum frame with tempered glass on the front and back ensures beauty and durability. 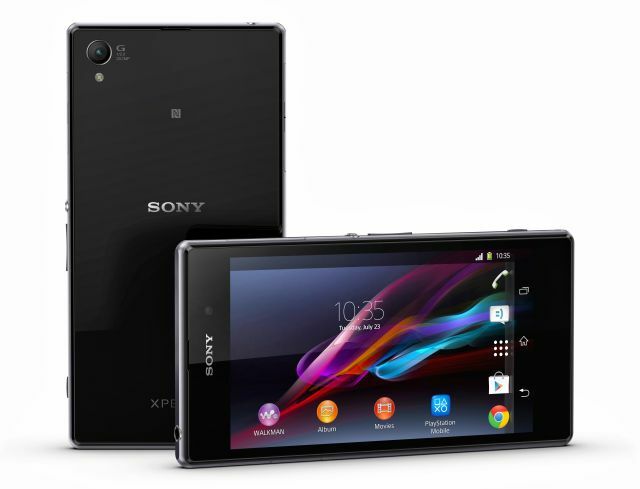 The Xperia Z1 comes with 3000 mAh Battery, 2 GB of RAM, 16 GB Internal Memory and Expansion slot MicroSD card up to 64 GB. The Sony Xperia Z1 is available in Black, White and purple color variants and it will launch globally from September 2013. No info regarding pricing. A welcome development but why don’t phone manufacturers be a little braver and put larger lenses on them. Nokia seems to be the only manufacturer that does this, and that’s only one phone.